Whether you are moving to a new apartment, coming home from college, or simply looking for a vehicle to transport your heavy supplies around, a cargo van comes in handy for many reasons. And the good news about a cargo van is that with so many rental car companies out there, it is relatively easy to find one. But chances are good you wouldn’t just go with the first one you found. Two companies that offer cargo vans for rent are Budget and U-Haul. While they offer the same basic vehicles, these companies are actually quite different. So which is the best for your needs? Budget was founded in 1958. Its headquarters are in Parsippany, New Jersey. Budget is a subsidiary of Avis Budget Group. In other words, it is affiliated with Avis, another popular car rental company. True to its name, the company is considered the top among its competitors for good rental rates. 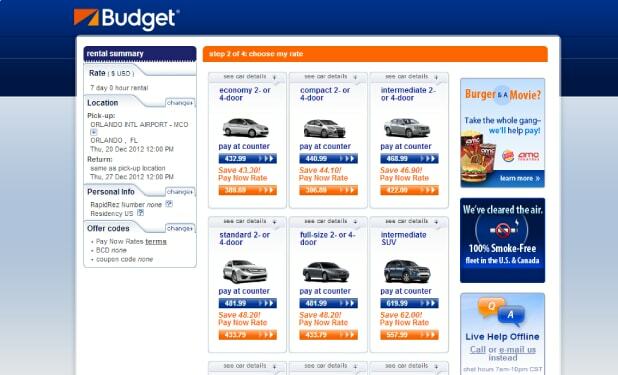 When you rent through Budget, you’ll be able to make your reservation online ahead of time to get the van that you want. When you pay online, you’ll be able to hold your reserved vehicle, too. Budget offers special pricing deals for consumers. For instance, Amazon cardholders are eligible for reduced pricing from a Budget-Amazon partnership. Budget also partners with hotels and other establishments in certain cities. This is worth considering if you are planning a one-way trip to a certain destination. Another key to booking through Budget is that customers who book a van between Sunday and Thursday, and those who book the farthest in advance, generally get the most favorable deals. Along with cargo vans, you can rent a truck-sized either 12 feet, 16 feet, or 24 feet when you rent through Budget. If you’re moving, you can enlist the services of Budget’s partner, MoveLift, to help you find local movers at your starting and end destinations. Established and based in Arizona, U-Haul is another company where you’ll find cargo vans and trucks for moving and hauling. U-Haul is considered to be one of the best rental companies for commercial and heavy-duty personal use. However, if you’re not quite sure what type of car is best for your situation, U-Haul’s user-friendly website offers some helpful information. U-Haul has over 20,000 physical rental locations throughout North America, including in all US states and every Canadian province. 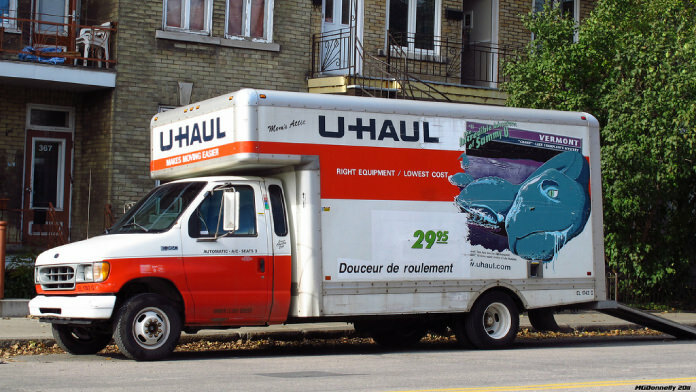 So regardless of whether you’re moving to the next town, the next state, across the country, or over the border, U-Haul makes it easy to pick up and return your rented truck. In addition to the rental van itself, U-Haul offers a variety of amenities that make moving easier, such as packing supplies, moving boxes, cargo tie-downs, and more. Along with the convenience of having a U-Haul center nearby, there is a wide selection of vehicles to choose from. 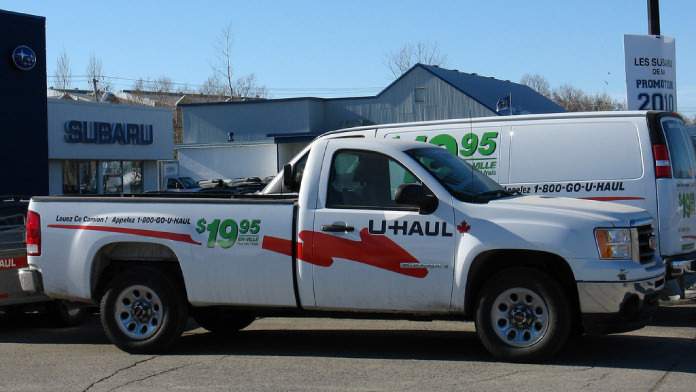 U-Haul’s fleet includes cargo vans and five different sizes of trucks. Although the cargo van can’t tow your vehicle, the smallest truck (which is 10 feet) can. All vehicles are outfitted with storage compartments and cargo space to help you organize your belongings during a move. And if you are worried about transporting fragile items, rest assured the trucks are set up with a special compartment designed to keep breakable items safe. In addition to the convenience of location and pricing, you’ll also need to consider what vehicles each company offers. Renting from Budget gives you an option of a regular cargo van or a larger truck. The cargo van that you’ll get is likely going to be a Ford Transit or a Chevy Express. The Ford Transit comes in several lengths. It can be customized to seat more passengers (between 12 and 15), or you can remove the seats to free up storage space. Amenities like an automatic transmission, climate control, and a radio are standard features. With the Chevy Express, you’ll get a two-passenger van with a maximum towing capacity of 10,000 pounds and a maximum payload of 4,282 pounds. Base amenities like air conditioning, an AM/FM stereo, and airbags are highlights of the Chevy Express. If you need a larger vehicle, you have a choice of several truck sizes. The 12-foot truck has a maximum payload of 3,100 pounds. This increases to 3,400 pounds for the 16-foot truck and 12,000 pounds for the 24-foot truck. With U-Haul, the commercial truck fleet starts with a standard nine-foot cargo van. The company’s cargo vans seat up to two adults. They feature cruise control, air conditioning, tie-downs, rub rails, and an automatic transmission. A cargo van that you get from U-Haul has a maximum payload of 4,000 pounds. It has an average MPG of 20, and it is equipped with a fuel-efficient six-cylinder engine. Renting from both Budget and U-Haul can give you a good deal on a vehicle. When you rent from Budget, it can cost about $75 each day to rent a truck or van. If you reserve and pay for your vehicle online, you’ll get a 30% savings upfront. Budget also has generous discounts for special populations as well as certain locations. So be sure to check if any apply when you go to rent your van! U-Haul offers a flat rental fee of $19.95 for its cargo vans. You just cover the additional cost of extra mileage (which is $0.79 per mile) and other fees, such as taxes and any insurance that you choose to get. The fees per mileage are adjusted if you are planning to do a longer trip or need to extend the number of days that you rent the vehicle. A 10-foot truck, which is the next size up, also costs $19.95 to rent. However, the extra mileage charge on this vehicle is $0.99 per mile. When you’re deciding on a company to rent a van from, both Budget and U-Haul are good options. Budget is known for offering some of the most competitive prices in the industry. However, U-Haul has a reputation for providing a professional moving experience. When you reach your end destination, U-Haul also offers a month’s worth of free storage.